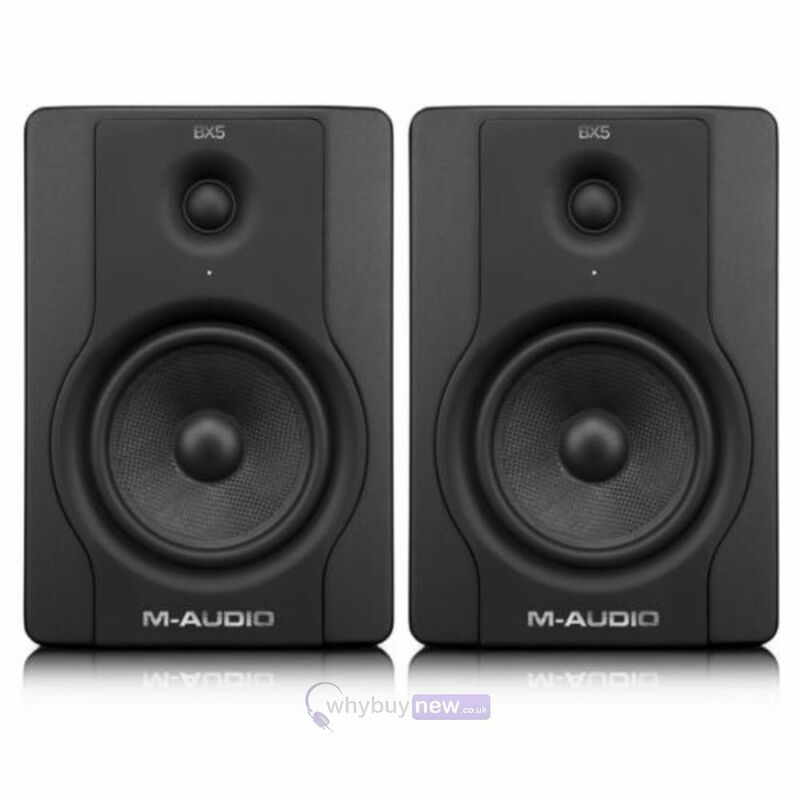 Here we have the M-Audio BX5 D2 Monitors (pair) in B-Stock. The B-Stock versions would have been on display at a training evening or trade exhibition only and will come boxed 'as new' with all accessories and a 1-year warranty. 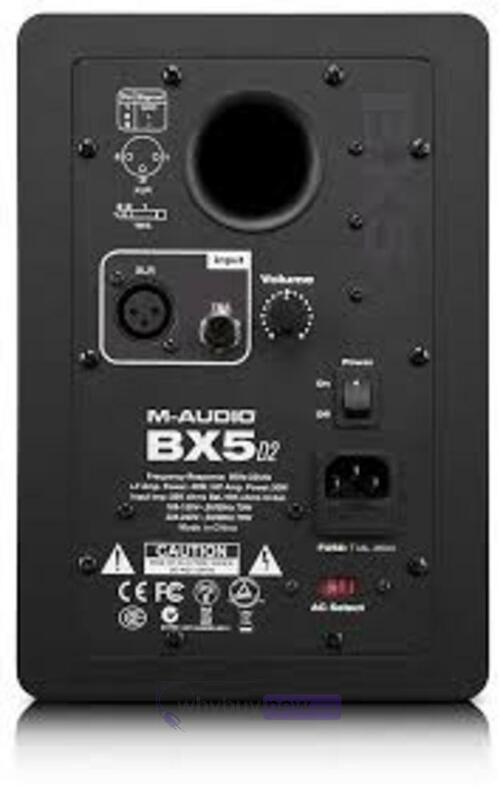 M-Audio BX5 D2 Active Studio Monitor. The impressive BX series of studio monitor speakers are highly regarded in the industry by professional musicians and producers alike. BX5 D2 monitors from M-Audio continue the legacy with the latest D2 model which features a clever, elegant new design inside and out. 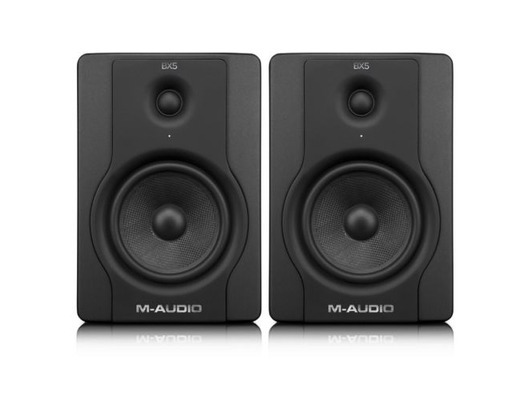 M Audio have integrated technology from their top-end studio monitors into the BX5's which are presented at a price which makes it suitable for studio, home studio and even bedroom use. Custom Class A/B analog amplifiers deliver superior dynamics and tonal accuracy across the frequency spectrum while the latest generation woven Kevlar LF drivers, and waveguide loaded silk dome tweeters provide rich, defined sound. With the BX5 D2, you'll enjoy the utmost accuracy in an engaging listening experience. Absolutely ideal for virtually all professional studio applications. BX5 D2 is ideal whether you're recording, mixing, or mastering and your monitors are your primary reference source. Accurate monitors let you hear exactly what's happening in your mixes-and give you the assurance that your music will translate well to other listening environments. The BX D2 series makes that same design philosophy and technology available to anyone with a passion for great sound. BX5 D2 helps you understand what's in your mix so you can make better decisions about how it will translate across a wide variety of systems-from MP3 earbuds to car stereos to audiophile rigs. BX5 D2 active monitors use high-frequency domes which are made from natural silk to counter the audible ringing that is inherent in the poorly crafted metallic materials. The high-frequency driver provides ultra-smooth frequency response up to 22 kHz. Meanwhile BX5 D2nitor's 5" low-frequency driver is constructed from woven Kevlar to ensure a lifetime of service. The cabinet for the BX5 D2 is designed for optimal audio performance right down to rounded corners for reduced edge diffraction and superior imaging. The custom rear port is designed to minimize air turbulence and resulting distortion while adding additional low frequency extension. BX5 D2 utilises Class A/B bi-amplification which dedicates separate power amps to the high and low frequencies. This provides ample headroom for even the loudest and most dynamic of mixes. Combined with a finely tuned internal crossover, the design ensures that each driver only delivers the frequencies that it can reproduce most efficiently, resulting in tonal accuracy and cohesive sound across the entire frequency spectrum. When monitoring, it's important to sit in the middle position or "sweet spot" between the two speakers-where the stereo image is optimized. BX5 D2 features a pinhole power LED that makes finding the sweet spot easy. You'll know you're in the right listening position when the BX5 D2 power LEDs appear to be brightest. M-Audio BX5 D2 Weight: 11 lbs./unit; 5 kg.